I cannot express how excited I am to be writing this post. It’s something I’ve dreamed about for years! Today I am officially 13 weeks along. If this is your first visit, you can read my announcement posts on my food blog, Kath Eats Real Food, here: Connecting The Dots and Itty Bitty Details. I decided to start a new blog rather than post about pregnancy on KERF for a few reasons. 1) The thought of designing and running a new blog sounded fun! New categories, fresh colors, different vibe. I wanted to do it all over again. And frankly I knew more about starting a new blog than I did about figuring out how to create a second RSS feed within KERF! A new blog just seemed to be the simplest solution. Baby KERF will be informally known as BERF. No, it’s not a beautiful word, but it’s pretty cool that we have one exciting BERFday to look forward to! And hopefully the baby will eat real food too – B.E.R.F. This blog is a journal and is first and foremost written for me as a digital keepsake of my experiences during these 10 months and the years that follow. I decided to make it public because I have made so many virtual friends through KERF and want to share as much of this experience with family and friends as possible. I love reading about other women’s experiences, so I’m hoping mine will be helpful too. When I reach a new milestone, I like to go back and read my friends’ pregnancy blogs to see what they were up to at this time! Even though I read them the first time they were published, it’s been so fun and helpful to have them archived for when I really needed to read them now that I am pregnant. I don’t have any specific goals when it comes to posting frequency, post topics or what I will and won’t share. I plan to just go with the flow. I ask that if you don’t like the intimacy of the blog, please just step away. It’s going to be personal, but I have an open personality and will share what I’m comfortable sharing. All opinions are welcome, but comments that are disrespectful, rude or mean spirited will be removed. Please respect me, my family and those who choose to come here. Over the next few weeks I’m going to be publishing everything that has happened – from going off birth control to conception (woo hoo!) through the current week. Feel free to skim the details – like I said, this is a personal journal more than anything else : ) Some days will be 2 posts, other days just one, and once I catch up I will post when I have something to say – perhaps everyday, perhaps every two. This blog is all fun! Matt and I have always talked about “when we have kids,” so the question was when do we begin? We began to talk about having kids after moving to Charlottesville in July 2010. (And I admit, it was mostly me starting the conversations!) For a while it was “we’ll start trying after we move to Virginia” and then it became “after the bakery opens” and then “after we buy a house and get settled.” Luckily those things all happened by late 2011, right around the time when my maternity insurance kicked in. There was a 6 month waiting period, and since I knew trying was on our radar, I went ahead and added the maternity package to my health insurance winter 2011 so it would be ready in the fall – just in case we were ready. I kept reminding Matt that it takes 9 months before you actually have the baby, and it could take us a year or more to get pregnant, so we should start trying sooner rather than later. At 28 going on 29, I could feel the clock ticking juuuuust a little. Especially since we had no idea how long conception would take. If I took 3 years, and we want 2 kids, then we better get started sooner rather than later. In hindsight, it was kind of dumb for me to write that. Because all these people were on the lookout starting in the fall! I wish I hadn’t written it, but I also wanted to be upfront – because I didn’t know how morning sickness would go! I also told about half the blog world later that year at the Healthy Living Summit and BlogHer. I guess I was just excited to start trying! By the time my insurance kicked in in August, I felt ready. The bakery was open and doing well, and I’d found a nice groove between my various jobs. I checked in with Matt, and while he wasn’t like “YEAH! Let’s have a baby!” he agreed the timing seemed right given that we weren’t getting any younger. I scheduled an appointment to have my Mirena IUD taken out in mid-September. If you asked me back then if I had any strategies in mind, I would have told you that we were just going to let nature take its course and see what happened. I thought that taking temperatures, ovulation predictor kits and all that jazz took the fun out of it and didn’t want to get into that unless I wasn’t pregnant in a year. I should have known better that a laissez-faire attitude is not how my brain works! Congratulations on BERF, but even more, congratulations on the baby. I couldn’t be any happier, of course! YAYYYY!!! BERF is live!! I can’t wait to read about everything leading up to today!!! 🙂 Congrats on the new blog and on little baby kerf to be!!!! I’m so happy for you both! Can’t wait to read more about Baby KERF! I’m so very excited for you & Matt (and baby to be)! Congratulations on beginning two new adventures (baby and babykerf.com)!! Yay sneak preview! 😉 Site looks great – can’t wait to read more. How exciting, Kath! I don’t have any kids yet but I’m really looking forward to reading along as you start (or, rather continue!) this journey! I totally know what you mean. I’m older than my husband (by 2.5 years) and I feel like my biological clock is punching me in the face (I’m turning 34 in 2 months) while he still thinks we should wait longer before trying. Gahhh! I am so excited to read this. I have been so excited for BERF to start since you mentioned it. I have 4 little ones of my own, and I am an avid reader of your regular blog. This is going to be a fun journey to follow you on. Best wishes to you and your growing family! I’ve said it before, but it’s worth repeating, Congratulations!!! I love following along on pregnancy journeys–it reminds me what it was like being pregnant. Aside from the morning sickness, I loved every minute of it. My baby girl is just over 6 months now and I can tell you without a doubt, everything you go through in pregnancy and as a brand new mom is worth it. I couldn’t be happier for you and Matt, Kath! And, BERF is looking fantastic! 🙂 Much love! Congrats! I’m so looking forward to following this new blog as I’m only two weeks behind you in my pregnancy. Funny, my husband is the one who feels the ticking of the biological clock more than me. I’ll be 32 by the time baby #1 arrives, and since we’d ultimately like two with maybe two years between them…I’m looking at 34 for the second go-round. Yay BERF!!! As someone who is starting to hear her clocking ticking a little bit, this is so exciting for me!! I have some medical issues (BOO!) that could complicate pregnancy, so I have a Dr appointment set up to discuss the future! Love the new header, very clever. What a special time for you both. it’s gonna blow your mind. And it’ll be the hardest job you’ll ever LOVE. I really can’t explain the magic that will happen when you first get a glimpse of your little loaf. Again, best wishes to both of you. So much JOY is on it’s way!!!!!!!!!!!! Love the look, all the wonderful pregnancy details to come and all things BERF 🙂 Can’t wait to follow along! I am so happy for you two! I remember the excitement of trying and having our boys! There were many bumps in the road, but all of it was so worth it. I can’t wait to read about your baby adventures now since you know I love your life and bakery adventures! So excited for you Kath! LOVE the design, you did an awesome job with this website! Congratulations to both you and Matt! Thank you for sharing this journey with us!! Congrats to you both! Beautiful site, agreed this is a wonderful way to document (and share) your experience! I am looking forward to all future posts. Love BERF and soooo looking forward to following along. Thanks for sharing Kath. My little guy is only 18 mths old and I expect maybe baby #2 may follow toward the end of this year and it warms me up inside watching beautiful people enter this incredible journey of being first time Moms. It’s SUCH a special experience! There absolutely is NOTHING like it! I do the same thing, go back and read bloggers pregnancy blogs again now that I’m actually pregnant even though I read them back when they wrote them! now all we need now is a MERF, Matt’s perspective as a future dad? Yes! I would love to see at least a guest post or 2 from Matt so we could get some of his thoughts. AH I love this already, and I”m so glad you’ve decided to do this blog. I can’t wait to read all the updates. Also…I normally don’t weigh in on things like this, but I’m going out on a limb and saying that I’m getting baby boy KERF vibes! Have you had suspicions yet? I thought girl for the longest time, now boy! Congratulations, so excited to add BERF to my blog love. This is such an exciting time, enjoy it all!! Congratulations! I can’t wait to read all about BERF! LOVE the new blog! As a mom of a two-year old and as we’re TTC right now, I’d love to follow your pregnancy journey so I’m looking forward to more posts! SO exciting!! Enjoy every moment! Beautiful job with the blog! I’m on the edge of my seat to read more!!!! Congrats! So excited to read along. I hope to start trying in a year so following your journey (and Caitlin’s) will be helpful! Thanks so much for sharing! I love how open you are! My husband and I are going to start trying this summer, and I so appreciate all the bloggers who have opened up! It will be so helpful as we one day (hopefully) get pregnant! I’m so excited to read this blog! I love the pictures of the Mama/Baby fruits and veggies in the header 🙂 Very creative! What a beautiful and well-designed site, Kath! I love the follow buttons on the side and of course the mama+baby props in the header. Can’t wait to read about BERF! Yay!!! Congrats. I’ve been reading KERF for a while now, and I’m excited to follow your journey! I totally agree with you… following pregnancy blogs has been most helpful to me – I am 20 weeks along and due July 4th! And I do have to say, morning sickness magically disappeared around 15 weeks for me. It’s so great! Great post! I’m so excited that we’ll be able to read about your pregnancy journey from the very beginning 🙂 Congratulations on the new blog AND the baby 🙂 The blog looks great, btw – I love the colors and the header. I just have to say I love this blog. So perfect for baby kerf blog! Excellent job! Looking forward to your posts on this site. It has reminded me that I have been neglecting my own blog during my move! Yay Kath! I love your new site. Very exciting stuff! Congrats to you and your whole family, and I am so excited to be pregnant at the same time!! This is so exciting! My baby is 17! It seems like only yesterday I was going through the same stuff. It’s such an exciting time! I love reading about all of it and remembering that time in my life. Congrats on BERF and the little one! Woohoo! The blog looks amazing, Kath! I think it’s great that you decided to start a new one dedicated to all things baby. I’m so excited for you and Matt. Congrats again! Yay! The new blog looks fantastic!! So excited for y’all! It might just be me & my blog-illiterate-ness (yup, definitely a word! ), but BERF comes up as “title unknown” when I added it to Google Reader. Hope this tip helps in case there’s a setting you need to update. Can’t wait to read more at BERF. Maybe it just needs more time to propagate across the internet!? I know that can be true w/ other types of websites & web apps. Otherwise, I have no idea. When I click on the RSS flag on my side bar and it takes me to feedburner, and i click “add to Google Reader” the title appears properly. When I put it in by hand…. IT’S FIXED!! Just checked again. Guess it just needed time! Yep… Just tried again, using same steps I had before & it does properly show the name! Happy Weekend to ya! Kath it looks beautiful! And is beautifully written as well, congrats on the launch! I love the header! It is so adorable, and so appropriate for Baby KERF! Your head shot is beautiful too! Yaaaaaaaaay and the design looks so warm and amazing! Congratulations on everything Ms K! The baby on ultrasound looks beautiful and so is your new blog!! Happy Second Trimester 🙂 ps I love the colors you picked for the blanket! I usually don’t comment on your blog but I had to comment today and tell you how beautiful this blog is and how gorgeous you look in your side profile picture on BERF! Congratulations on your accomplishments and on your baby 🙂 ! I can very much relate to saying “oh, we’ll just play it by ear” and then suddenly you are OBSESSED with taking your temperature, a whole world of new acronyms, analyzing your cervical fluid (TMI is welcome here, right? 😉 ) and peeing on all the various sticks. That’s just how it goes! I’m nearly 24 weeks with my third, looking forward to following along as my first “baby” is about to turn 8! Can’t wait to read more about your journey. Congrats again! I really appreciate your honest with Matt not being quite first in line to jump on the baby train (more like buying a ticket but waiting in the station). My husband is the same way- he doesn’t want to be an old dad, but he really isn’t exactly perusing The Land of Nod website like some of us. It’s good to see that they come around. YAY! Congratulations on the new blog (and baby, of course)! It’s going to be like going back in time since I heard a little about it while it was happening 🙂 The ultrasound pictures from yesterday are SO CUTE!! I can’t wait to meet BERF!! Congratulations again! I am excited to follow your pregnancy blog. Me and my husband are in the same shoes as you guys. Approaching 30, been married for almost 5 years, feeling the clock ticking but trying to figure out when to take the leap into parenthood. Like the concept for the banner. Yay for BERF! So excited to follow along! I am SOOO excited about this blog! I used to read KERF but stopped (nothing personal – food blogs in general just didn’t interest me anymore) but during a slow day at work I stumbled back…and learned you were pregnant! Yay! I’m 11 weeks pregnant (with my first child) so BERF couldn’t have come along at a better time for me 🙂 I love hearing about other women’s experiences and cannot wait to follow along on your journey….and hopefully pick up some good information since you’re a few steps ahead of me! I was hooked when I read your comment about apples – I eat at least 2-3 per day now! Pregnancy is hands-down the wildest experience and I feel like an alien in my own body. Best wishes to you for a healthy pregnancy! Just wait…it gets totally more wild! I am 30 weeks now, and remember thinking (at 11 weeks) that 30 weeks seem so far away…now I can barely remember my first tri (not that I want to, good riddance morning sickness!). Congrats Kath! So excited for you 🙂 Enjoy your pregnancy, hopefully you will feel good the whole time! Enjoy your time with Matt and do some things for yourself too. I have a 4 month old and he keeps me on my toes! I am so incredibly excited to read all things BERF & be a part of this experience!! =D Congrats again, Kath & Kanz!!!! So exciting! Is Matt excited now? You post kind of makes it sound like he isn’t all that into it. It think it would be totally different if it was Matt having the baby growing in his body. It’s kind of difficult for men to feel anything until the baby is actually born or until they feel the baby move in the belly. It can even take a bit of time after the baby is born before they really connect. My son is 4 months and my husband is really enamored with him now! It is hard for the papa’s to help when all the baby wants is mama! I am so excited to read about this journey you and Matt are on!! Thank you for being so open on your experience and hopefully one day I’ll be able to come back and read this again when I am ready for a baby! How exciting! This is going to be a great blog, I just know it. Good luck with it, and with baby!!! I love that you created a new blog to write about your journey into parenthood. I can’t wait to read more! Kath I am so excited for this new blog!!! I can’t wait to follow your journey through pregnancy!!! Loved the KERF ultrasounds — that’s no bun in there, that’s a baby. I can’t stop thinking about how the baby develops after seeing that documentary together last week. P.S. What’s with the comment time stamps being incorrect? Found this fun list of names – so many to choose from! I was typing a reply and the page refreshed and I lost my words. I’ll keep it short! 🙂 Can you divulge which documentary you all watched? Thanks! Congrats on BERF and the baby, too of course! Kath, I am really looking forward to this blog! I’m also an RD, and the same age as you (2005 grad) and I just had my son 5 weeks ago. I’m looking forward to a science-y perspective on pregnancy and childbirth. Best of luck on this exciting adventure! Ps is that really your grandfather posting? If so, I am in awe! My father is G-Daddy! We call it his “rapper name,” lol! I am so excited for you and your growing family! I have a feeling your story of letting nature take its course may be similar to ours in a sense that it surprisingly didn’t take too long to get pregnant! I’m trailing a few weeks behind you (7 weeks today) so I’m really excited to share this journey with you and hopefully other new moms as well because it’s definitely a big life change and learning experience these next 10 months- 18 years!!! Yay, BERF! Hah, I thought I was going to be totally relaxed about it and just let my body do its thing, but it didn’t take long before I got sucked into the whole TTC culture. Now I’m not allowing myself to read those message boards anymore (they stress me out! ), but charting and being aware of my cycles is something I think I’ll be doing until menopause – beyond the fertility part of it, it has really helped me understand a lot of my moods and migraines! Anyhoo, can’t wait to read more, thanks for sharing this journey with us! I’m curious to know if the removal of your IUD was painful. Congratulations! I’m a regular KERF reader and Cville-ian and while I rarely comment on blogs, I can’t help but say how excited I am to keep up with this new blog. What a beautiful, happy family! I’m excited to read your baby updates but I just wanted to let you know (which you probably already do?) that the ads that popup at the bottom of the page are pretty distracting – perhaps there is another way to display them? I know it’s your page, just wanted to make you aware. Thanks for the feedback, and I agree with you on the bottom one. Unfortunately there’s no way around it with my sponsor. Possibly in the future. You can close them, on the left hand side there is a place where it says close with an x …click on that and the ads are gone, BUT you have to do it EVERY time you come on the blog. They are supposed to be gone for 90 minutes at minimum if you close them. I’ll double check on that. So excited for you! Can’t wait to read more! Congratulations my sweet Katie! You must be all tingly with excitement. I hope it is a girl just like you. Cute, excited to follow along! There is something going on with the page because for me it constantly refreshes weirdly and there are pop ups and stuff in the way?? Strange…this may be related to the Next arrows (I had a similar problem yesterday). Please let me know if it continues. I’m using a different computer, but it seems fine now. So it just keeps refreshing now allowed you to really read? There is an ad at the bottom of the page – but it should never climb up any higher. Love BERF! Woo hoo! So excited to see it here! Can’t wait to hear more of your story and see this site and journey unfold! I have been reading KERF for a few years now, and I’m just so excited for you! I just had my second child January 10th, it will be so nice to read this baby blog too! I can’t wait! Wow! Sounds like you didn’t have any trouble at all getting pregnant if you took the IUD out in mid september and were pregnant essentially 2 months later. Lucky! Can’t wait to hear about the rest of your pregnancy. Best wishes! bahhahahaha love Matt’s “first” comment! 🙂 Awwww congratulations on this new site “conception”! 😉 It’s so cool that your baby has a blog now. And very good thoughts on conception period–I guess for most couples it’s harder to conceive than I initially thought. I have been waiting for this for WEEEEEKS! I am baby obsessed, so I am going to love reading everything! I can hardly wait until you decorate your new nursery? You are such a great decorator! So excited for you and Matt and BERF! Been looking forward to it and reading your journey…Congrats again! That is what was happening to me last night!! It was frustrating. Please let me know if it keeps happening. 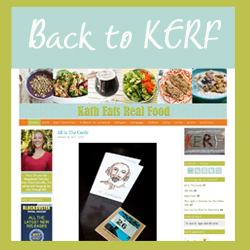 I actually stumbled onto KERF about 8 months ago when I was searching for oatmeal recipes 🙂 I have been hooked ever since! I have been awaiting this blog since your announcement, I am actually two weeks ahead of you (15 weeks today!) so it’s been fun to read along and “share the experience”. I can’t wait to read more! Congratulations! Thanks for sharing! I wish I had known you were on Mirena (not that you were obligated to share or anything). It was hard finding information on Mirena from people who had not had children. Its great to know that you didn’t have trouble conceiving after. Congrats on the new blog and of course, the new baby on the way! Really looking forward to reading about your pregnancy and parenthood adventures! I am just over a week behind you (12 weeks tomorrow) with twins! 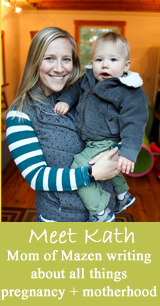 Love the new blog and am so excited for you and your family! Aaahhh! I whole new dimension in grandparent naming — I like it. Thanks Gramma Tofu! Yay! I’ve been excited for this blog ever since I saw the news that you were starting one over on KERF! I’m Anon for Now because I’m almost 6 weeks along with my first baby, and while I’m so so so excited, it’s too early to be telling people. I live in Cville and know lots of people who read KERF and/or are friends with you, and I don’t want to out myself…yet. 🙂 Anyway, HUGE congrats! I’m very excited for both your bebe and the new blog. I’m very grateful for your willingness to share your experiences – since you’re about 7 weeks ahead of me, I’m looking forward to learning what to expect before it happens to me – ha! 🙂 Congrats! Take care of yourself. Ahhhh!! Dying to know 🙂 We must get together soon. Going to the birth expo next weekend? I’m going and we’re going a baby talk lunch. YAY! So excited for BERF! Hooray for BERF! Kath, the new blog is gorgeous and such a wonderful idea. I’ve been reading your blog for years, and now that my husband and I are trying to get pregnant, this new blog couldn’t come at a better time. Kind of comforting to have you being so open with your experiences. Does that make sense? Thank you for your openness and willingness to share your life with your readers and I can’t wait to read all the BERF posts! This is so exciting, Kath. You have grown so much as a blogger and PERSON the last several years and it has been really fun watching you grow. Very happy for you and excited to read about your baby adventures! Much congratulations! Thanks Lyn. mmmmm – placenta oatmeal! I have heard of women doing placenta smoothies before – I definitely could never eat that! I’ve just gotten the placenta of my 2nd child encapsulated (8 months post partum – placenta was in deep freeze). I thought it was so weird when I first heard about it but a friend talked me round. Great for milk supply and warding off PPD apparently…I’m skeptical (and don’t have problems with either of those) but figured why not? I’ll give it a go! Planning on doing some pumping to donate, so hopefully the capsules with help with milk supply when I start doing that. I’m hoping to encapsulate! My mom was shocked, but I think a lot of people are doing it. I hear it’s not too expensive. Will be so interested to hear your experiences! Now you have GOT to add a capsule to your oatmeal sometime. Just for kicks! YES! It was a giveaway too – someone called me out on it! I remember that! And I remember that I totally rolled my eyes, thinking that people were reading way too much in to things! But they were right! So excited for this blog! I hope to be pregnant with my first by the end of this year. I am 31 and have been married for nearly 9 years and my husband is so much like Matt, but is finally on board! oh boy, clock ticking. not getting any younger. geez-bus! i’ll be 30 in a month and nary even a boyfriend in site. i better go find a fertile pole to ride. thanks for the reminder!!!!! So happy for you and Matt! Can not wait to start reading BERF and keep reading KERF! You rock and are such an inspiration to people that you do not even know. I love your blog and hope to visit Great Harvest someday. Re: Grandpa names, my brother’s in-laws are “Glamour and Chief”. Fits them perfectly! and LOVE the big & baby veggies theme. Keep the posts coming! Love the header pics, so cute! Yay! Looking forward to reading more of BERF. Exciting and fun. My husband and I had the “baby talk” the other day so it’s great to follow along someone else’s journey, so I can learn a thing or two. Yours (KERF) is one of the few blogs I enjoy reading on the actual site instead of in Reader because it’s such an attractive site. This one is no different. Congrats on the new site and ( more importantly) Baby KERF. Thanks Jenny! What a compliment. i love this blog! so happy for you, Kath. enjoy every minute, when you get a round tummy… how SWEET you will be! you are already sweet, but you know what i mean. 😉 Love ya! I can’t wait to follow along this wonderful, exciting journey with you. 🙂 Thanks for sharing. This is so very exciting! I’ve already said it on KERF, but congratulations to you guys! Haha- I love that Matt was first to comment. Dad’s on top of things already! I can’t wait to hear the story unfold- and to hopefully look to this blog for reference soon enough for myself! Congrats on the new blog and the exciting journey you are starting!! Yay!!!!! Congrats and I am anxiously awaiting the next post! Would love more info on your insurance addition, I haven’t thought of that and maybe I should before we start considering baby!!!! And so glad you are feeling better! Ahhhh just typed up a whole post and the page refreshed and I lost it! We decided to re-do our whole insurance package in combination of adding the maternity, which was an additional $71/month. We used to have a higher deductible and lower premium that had 30% coinsurance. But imagine if our hospital bills – in a worst-case scenario – were $100,000. That would be a $30,000 cost. So we went for a higher monthly premium, lower deductible that was covered 100% after the deductible. We now have a $2500 deductible and pay $350/month for both of us and maternity. So the baby will cost us $2500 max this year (plus premiums). Congradulations on BERF! How exciting for you! I remember living on cloud 9 for 9 months before my beautiful baby boy came into my life…we’ve had quite the journey but I wouldn’t change it for anything! Motherhood is the best thing that has ever happened to me outside marrying my husband! All the best to you on your journey! Sounds a bit like me and Stephen. I sort of started more than most of the convos about having a kid. Then we tried . . . twice . . . and it happened like immediately. Hahaha. SURPRISE! I am so excited to follow your new blog! I wanted to comment to let you know how adorable the BERF header is! Love it! Enjoying BERF already! Looking forward to this new blog! Congrats to you and Matt! What a great first post. I look forward to reading more posts about your pregnancy. My fiance, Sean, and I, have been discussing kids in our future (before we both weren’t on board). I’m 29 now but we’re not looking at having kids for at least a few years, if not more (maybe five?). Is it really difficult to become pregnant in your 30s? I’ve heard that once 30 hits, the number of eggs you carry decrease at a rapid pace. I’m really curious because my mom had me and my two brothers in her 30s and it doesn’t seem like any of us were accidents, lol. I don’t really want to think about alternatives should it be difficult for me to become pregnant but every day that passes I think about it even more. It does get more difficult, but tons of women have babies in their 30s (and 40s) so if you’re not ready, I would talk to your doctor about probability and things. Everyone is different. I had my first at 37 and my second at 39. I didn’t have any trouble getting pregnant with either one. I wouldn’t worry about it, but definitely make your desires known to your Dr.
Kath – the ad at the bottom definitely doesn’t stay away for 90 minutes. I had to type the comment twice because the ad popped back up and my in process comment was gone. LOVE THIS! congrats and can’t wait to follow! Our first baby cost us a total of $450. That was $200 for the Doctor and $250 for the hospital. A second hand crib, a couple dozen cloth diapers and a few clothes and we were good to go. My how it has changed. But that was 41 years ago. We paid a bit more for the second one but we didn’t need to buy the crib and clothes. They were both boys. Congratulations on the baby and the new site. Relax and enjoy because before you know it, that baby will be 41 and you will wonder what happened to your little guy. WOW!! I think standard these days is around $10K for a hospital birth without complications (although I could be way off). Insurance helps a ton! Here’s to hoping the government doesn’t change military healthcare. My son’s birth didn’t cost us a dime. Aww, congratulations I love this site already! Yay! The website is so cute! Looking forward to reading your posts ……”due” to the fact that I am pregnant too. 11 weeks today, so we are “due” right around the same time! I love the BERF page! I think it is awesome how you did a separate blog for it, I was thinking of doing a second blog If I have another kid one day! I feel it would be a lot of work, but worth it! I don’t want my blog to be overcome with baby stuff and want to keep it separate, not one big mess, haha! Haha, too cute Kath – love it! Love the comment about placenta talk! I can’t wait to hear all about your journey! Yay! Can’t wait to follow on your journey. I’m a pregger too and seeing all these other bloggers start families is soooo exciting. I love the BERF design! Congrats Kath!! I am so excited for you and it’s great to read about your pregnancy and learn about someone pursuing being healthy at the same time! I didn’t know you could use an IUD before ever having a child. I thought you had to give birth once before getting an IUD, never understood why though. I love the name BERF, it’s so cute and probably a funny noise a baby makes at some point ;). Really excited to read this blog too, awesome and so over the moon happy for you. You’re going to be such a great mom!! Yeah I’m excited BERF is finally up. It’s so cool to see how many others are pregnant at the same time. I’m 29 and 11 1/2 weeks right now. I also found it interesting that you were able to get Mirena, I was told by two different doctors that they don’t give it to anyone that has not already had a baby and they both informed me to come back after I had kids and ask for it. Beautiful site. I had to take a break from KERF and will have to limit my time on BERF. You were giving me baby fever. . .I already have three kids! Thank goodness for IUD’s! 🙂 So happy for you. The photo of you in pink in the upper left hand corner of the page is… FLAWLESS. GORGEOUS. GLOWING! Who took your photo? I’m currently struggling with my weight. I never had to before- I used to eat anything I wanted. Now I’m 27, and my father said, “I’m concerned about your weight. You don’t look as good as you should.” I was devastated, crying for days. Looking to you for motivation. My dad used to say things like that to me. At the time it bothered me, but now I realize he could tell me what maybe others couldn’t. Dads need to work to be diplomatic but do forgive him! Thank you 🙂 Photo by Andrea Hubbell here in cville! Yay for the new site! So excited to follow and read about your journey. It is so fun being pregnant (30 weeks!) and reading about other women’s experiences. I am excited for you both! this blog is going to remind me about my ticking clock every day, but I refuse to stop reading. SO exciting!! I’ll be glad to see all the blog posts. Me and my husband just married, and a week before I got the positive pregnancy test. My question was could I predict the baby’s gender before ultrasonography. It seems to me that http://www.baby-gen.com could help. I fill the form and get the girl. We are so happy.